and she has trouble concentrating. be too ill to live alone. For 10 days, Kim Teske has been refusing to eat or drink. Her speech is garbled; she can still smoke, but her inhalations are shallow; she is struggling to walk and she is withdrawing into herself, as though she is moving ahead to a place where we can’t follow, at least not yet. At one point, she lies down for a nap in the sprawling split-level house on the edge of Orangeville, Ont., where her family has gathered from halfway across the country to say their goodbyes. One of her sisters crawls into bed and snuggles under the duvet with her. A few hours later, when Kim is driven back across town to her own apartment, a brother has to carry her up the stairs. Kim, one of six siblings and always seeming the most vulnerable, the most childlike, wants to die. She has Huntington’s, an incurable genetic disease that combines aspects of Parkinson’s, Alzheimer’s and schizophrenia. At 52, she is still living on her own, but fears that, if she doesn’t act now, she will end her days in an institution with strangers pushing mush into her mouth and hosing her down after she defecates. We were sitting at the table in Kim’s sunny yellow kitchen on a winter weekday morning. Her sisters Dawn and Marlene nodded in agreement. Her mother, Gwen, watched warily from the couch. Kim’s black camisole peeked out from an unbuttoned pink and black checked shirt tucked into her jeans, but the effect was more boyish than voluptuous. “I wore this to the Huntington’s fundraiser two weeks ago and I had two fizzy drinks. They told me not to get drunk,” she explained, in an unbridled style that I came to recognize as Kim-speak. The four of us could have been sitting down to a game of euchre; instead, we were talking about the right to die. This was new territory for the Teskes and all of them were struggling to keep their equilibrium while navigating its emotional, medical and legal shoals. Kim couldn’t afford to fly to Dignitas, an assisted-suicide clinic in Switzerland that accepts foreigners; her doctors wouldn’t help her die; she had no legal access to lethal drugs; and she didn’t want her family to face criminal charges for assisting a suicide. Her only option, as she saw it, was to starve to death, even if most experts predicted it would take two full weeks. Nobody really expected Kim to succeed. It would be too hard, too awful a death – especially for somebody like Kim, who loved to eat and never seemed to gain an ounce, no matter how many helpings she consumed. She was the sibling who didn’t make it in the academic stream in high school and trained instead to be a barber; she was the family jokester who delighted in sneaking up and snapping the bra straps of her adolescent nieces; she was the single auntie who greeted any man under 50 by asking, “Are you married?” No matter the response, she demanded a hug. “Give me a squeeze,” she would entreat complete strangers. Going without nourishment when you are terminally ill and your body is already shutting down is difficult enough. Donald Low, the Toronto microbiologist with a terminal brain tumour who made a video plea last year for legalizing medically assisted dying, stopped eating and drinking in the last stages of his life, but he was deeply sedated and under the care of a top-notch palliative team. Even so, he lasted nearly a week, six days of which he couldn’t communicate with his grieving family. Kim’s task was infinitely harder because she was not dying, at least not imminently. Patients with Huntington’s typically live with a disintegrating mind and body up to 25 years from diagnosis. There are early– and late-onset variants of the disease, which affects one in every 7,000 Canadians, but most people are diagnosed between 30 and 50. Because Kim refused to wait for the inevitable, she was planning her death while still of “sound mind,” as the clinical description has it, and had the capacity to live independently. But that didn’t mean she would go quietly. 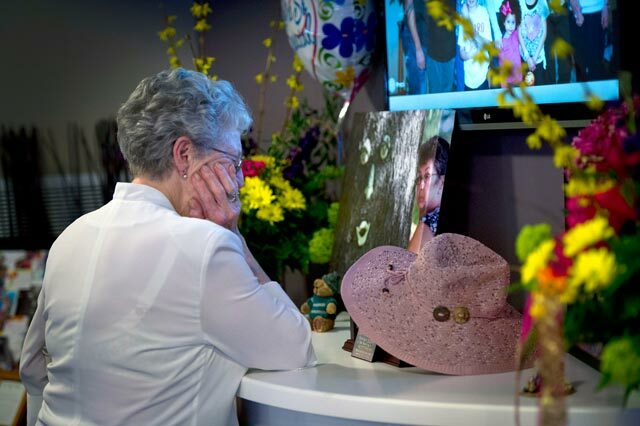 She wanted to leave a final message supporting the work of Dying with Dignity, a nonprofit organization lobbying for the right to medically assisted death and an end to the Criminal Code prohibition against assisting a suicide. That’s how I had heard about Kim. But this is more than a right-to-die story. This is a story about family: how it copes with a devastating illness that has targeted some members and spared others, filling some with despair, others with resignation and making someone like Kim suicidal. It could be your family, it could be mine. Even before Kim’s death wish, life was hard for the Teskes. Gwen and her husband, Larry, were from hard-working stock – she from Saskatchewan, he from Ontario. Larry was 42 when he died of testicular cancer, leaving a genetic secret that lay buried for 25 years: Huntington’s disease. Because Larry’s symptoms were masked by cancer, nobody suspected that he may have passed on a neurological time bomb to his children. Back then, Gwen was more concerned about the present than the future. “I looked into the coffin and said, ‘How do I go on from here?’ ” she remembered thinking. “But the good Lord gives you strength,” she said. “I had to be there for my kids.” At 39, she had six children to support. The eldest, Brian, was 16. The youngest, Deanna, was 9. Gwen put in long hours running a restaurant at a truck stop to put food on the table. As soon as they were old enough, the kids worked there on weekends and after school. None of the kids gave Gwen any trouble. “Not real trouble,” said Lynn Teske, who married Brian in 1978, when he was 21 and she was 19. They had met a few years earlier at a high-school dance, but he had disappeared with a pal when the music stopped. “A girlfriend and I used to drive around Orangeville looking for him, until I found him,” she said, laughing at her sweet-sixteen boldness. Nearly 40 years later, she still won’t let him go. Brian had gone to high school in nearby Mayfield, but he switched to Orangeville District Secondary School for Grade 12, “and then we were in the same school.” For nearly 20 years, life was busy but good. They had two children – a son, Jason, and a daughter, Sarah – and eventually Brian ran his own construction company with brother Stuart, digging basements and installing septic systems. Video Brian’s family describes how he began to change. His hands started to shake, he became belligerent and would make strange decisions. He was the first in the family to be diagnosed with Huntington’s. He also began making strange decisions, according to Stuart, a taciturn guy who fails to hide his tender heart and strong emotions. After 10 years in business with his brother, Stuart quit and moved to Florida to work with standard-bred horses. That’s where he met his wife, Rebecca, and their teenaged daughters, Victoria and Gabriella, were born. Of course, Lynn immediately searched the Internet. “The more I read, the more I knew in my heart that that was what he had.” But denial came easily because nobody else in the family had Huntington’s – his mother was robust, and all his younger siblings seemed fine. Brian finally agreed to go for DNA testing in 1997, when he was 40. But it was another five years before he was willing to ask for the results of the simple blood test that would explain his increasingly bizarre physical and emotional behaviour. “He didn’t want to know,” Lynn said. This is a common reaction. At best, one in five of those at risk for Huntington’s are tested, because knowing doesn’t help when you have an incurable and largely untreatable disease. Lynn, nevertheless, tried to persuade him. “We can’t deal with what we don’t know,” she told Brian. The entire family went to hear the results in July, 2002. By then, Brian was 45, Lynn was 43, Jason was 25 and Sarah was 22. Lynn said she remembers the doctor saying: “You know, Brian, when I open this envelope, I could be handing you a death sentence.” Even before the doctor read the diagnosis, Lynn knew that it would be positive because Brian had become that much worse. Still, the confirmation was a shock. It took a year for everyone in the Teske clan to accept the news and to suspect that the disease had probably come from their long-dead father. Five of the six Teskes already had children; if they had Huntington’s, there was a 50-50 chance they had unwittingly passed it on – a horrifying thought for any parent. Brian’s daughter spent years obsessing about the disease, but refused to be tested. “I didn’t want a death sentence. I didn’t want to know at 24, 25 or 26 that I was going to be dying of Huntington’s,” Sarah said. But that didn’t mean she didn’t worry: “If my arm had a twitch, I would think that was it.” She reached a point where the tension was so grinding that she realized knowing was better than not knowing. By then, she had decided that, if she were positive, she wouldn’t have children, although there is now a complicated and costly in vitro fertilization procedure that tests embryos and implants only those that are free of Huntington’s. Finally, in July, 2008, on a day Sarah could only describe in superlatives as “the best of her life,” she learned she was negative. Now, she is married and the mother of two small children. On the same day Sarah found out she had won the genetic lottery, her aunt phoned home from Regina to say she had lost. Deanna, the youngest of the Teske siblings, had tested positive. Her daughters, Chantelle and Shelby, were in Ontario visiting their grandmother and extended family. But before they even had a chance to celebrate with their older cousin, they had to grapple with the horror of their mother’s diagnosis, which was potentially their own. That is how Huntington’s works: It is a capricious disease, sparing some and skewering others, like a fickle finger of fate. Deanna will tell you now that she wasn’t surprised to learn she had it. The year before, when she had gone back to Ontario to celebrate Brian’s 50th birthday, she already had a strange tingling in her fingers and toes, and some jerky movements. Deanna can no longer work as a hairdresser, manage simple tasks like holding a telephone receiver or speak without slurring some of her words. Yet, she radiates cheerfulness, even as her arms flail about like an aberrant windmill. It’s as though she got an overdose of chorea (the involuntary movements that typically accompany Huntington’s) and escaped the depression and belligerence that are also characteristics of the disease. Most of the Teskes long suspected that Kim also had Huntington’s. Deanna said that Brian kept “bugging Kim to get tested” because there were doctors and programs that could monitor the symptoms and ease some of them. But Kim was in denial and, Deanna added, may have gone west a decade ago to escape family pressure. After working for close to 20 years as a barber not far from Orangeville in Alton, she settled near an aunt in Invermere, B.C. A few years later, though, Kim could no longer cut hair and was working behind the counter in a delicatessen – until even that job became too stressful. “There were times when she was overhearing customers say, ‘Oh, my gosh, I think she is drunk,’ ” younger sister Marlene recalled. “Brian had it and so did Deanna, and I was hoping and praying I didn’t have it, too,” Kim told me the first time we met. She was finally tested in 2008, the summer of reckoning for the Teske family. She was 47. Sisters Dawn and Marlene flew out to B.C. to bring her back to Ontario. A year later, she could no longer drive or handle simple tasks. Though she technically lived independently, her mother and Ontario sisters hovered lovingly. Of the six siblings, only Dawn and Marlene haven’t been tested. They believe they have been spared because, in their 50s, they are still symptom-free. Stuart was at risk of losing his workplace life insurance until he tested negative. “I knew I didn’t have it because I had no symptoms, but I did the test for my kids.” Does he feel bad that he and his family are safe, while three of his siblings are doomed? “No,” he said. “It bothers me that they’ve got it, but I’m glad that I don’t.” As for Dawn and Marlene, they don’t have time to feel guilty. Besides full-time jobs and their own families, they are at ground zero, helping to care for their afflicted siblings, including Brian. At 57, Brian lives in a long-term-care facility. He can’t walk or feed himself, his speech is almost incomprehensible and he frequently chokes on his puréed food. Lynn drives to the nursing home on her way from work, bringing him an Iced Capp from Tim Hortons as a treat before she spoonfeeds him dinner. Video Deanna’s daughter Chantelle, right, tested positive for Huntington’s and, although she wanted children, she ultimately decided against having any. ‘I don’t know if I could willingly’ pass the disease on, she said. Chantelle tried for a brave face when I met her and younger sister Shelby at the Smiths’ bungalow in Regina. The two girls were nestled like cats on their parents’ chesterfield. Outside the picture window, a city crew was cleaning up fallen trees from a brutal winter. The pain in her voice was almost audible as she described the possibility of her son having the same disease as his father. For anyone whose family has been plagued by Huntington’s, watching for symptoms is almost as harrowing as the fate they herald. There was a time when Brian wanted to end his life. “He always said he was not going to live in a nursing home,” Lynn said, “that when it got to the point where he needed someone to wipe his bum, he didn’t want to be here.” But somehow, he never found the means or the opportunity. He waited too long, some of his siblings will say quietly. “I’m here to help you through the disease but not to end your life,” Lynn remembered the doctor saying in response to Brian’s entreaties. Although grateful for the medical care, the treatment programs and the help from family – for years, Gwen spent one day a week with Brian, feeding him lunch, taking him for drives and doing the family laundry – she wishes there was more home care available. “If you have lots of money to pay somebody to come in, you are fine. But if you don’t, you are euchred,” she said. There was a crisis in the summer of 2012. They had a hospital bed in the kitchen, but the bathroom was upstairs and Brian was falling a lot. Sometimes, so was Lynn, trying to keep him balanced as she propelled him up and down the stairs. That October, Brian moved to the nursing home, where he is by far the youngest male patient. Eventually, he won’t be able to swallow mush and he will either choke to death or he will be put on a feeding tube. Lynn doesn’t think he wants that, but she isn’t certain. “He has a son and a daughter and he has grandchildren,” she said. “And then there is his mom and his sisters. He has a lot of family around him.” What she doesn’t say, but which is obvious to anybody who has seen them together, is that he is still gobsmacked in love with the girl he met at a high-school dance. Two months later, she sits on the edge of her bed, smoking cigarettes – the Teskes are like chimneys when it comes to nicotine – and looks out the second-floor window at the oak tree in the front yard. It is her talisman. Kim believes she will be resurrected after her ordeal and come back as part of the tree’s towering presence. Whether she is saying that to reassure herself or her family is moot. It is the mantra that sustains her day after day of refusing food and sipping only enough water to swallow her medication. Both Ontario sisters have taken time off work, made sure that Kim’s do-not-resuscitate form is prominently displayed on the refrigerator, gone with her to a local general practitioner (who has refused to help Kim die) and applied for palliative and personal care for their sister. For the first time since they celebrated their mother’s 75th birthday five years earlier, the Teske clan, including Brian in his chair, congregate at Dawn’s house on the outskirts of Orangeville. The place is a multi-generational jumble of kids, friends, food, instant coffee (with an occasional shot of Bailey’s) and frequent trips to the garage, where the smokers gather around an old wood stove to trade anecdotes and josh Dawn’s partner, Paul Omrode, about the two gleaming Harleys parked in front of the door, patiently anticipating a summer romp. The fast could stop if Kim changes her mind, or if the authorities step in. But nobody makes a move, waiting like bystanders at a traffic accident. It is horrible to watch, especially seeing the suffering in Gwen’s face as she chain smokes in the garage. Before Stuart and Deanna head back to the airport, knowing they will probably not see their sister again, the siblings gather to plant a burning bush outside Kim’s apartment. She is now too weak to walk to the window. 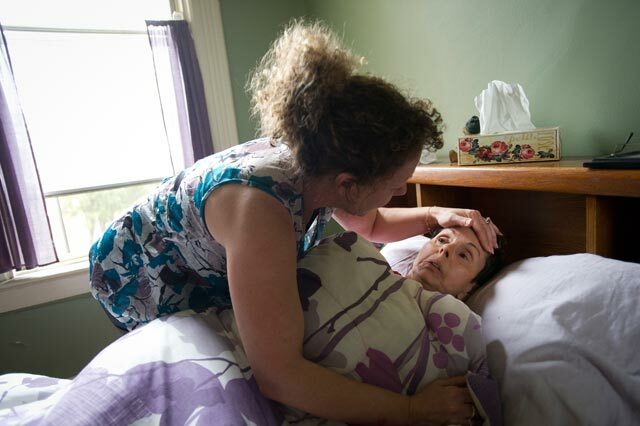 A visiting palliative-care nurse thinks it will be several more days, but Kim has other plans. She dies peacefully, with none of the delirium or agitation that some watchers had anticipated, around noon on day 12 of the fast, with Dawn by her side. When the police are summoned, along with emergency services, they decline to lay charges. It is three days before Kim’s target date. Half of Orangeville seems to have gathered for Kim’s memorial celebration on May 9, her 53rd birthday. There is food, caffeine, flowers and a slide show documenting her life, from baby pictures to horsing around with nieces and nephews. Nothing has been air-brushed, including a picture taken the day before she died, looking gaunt and focused on the camera as a niece gives her a hug. Kim, the most childlike Teske, has given them all a lesson in courage. She achieved her goal: to die on her own terms. That is a legacy nobody can deny. Whether it will help change the law, however, is beyond her control. The only certainty is that family has prevailed. “It hasn’t been easy, but you have to stick together and carry on from there,” her mother concludes. When the Teskes gather in July to celebrate Gwen’s 80th birthday, Kim is not forgotten. They mourn again. – Toronto author Sandra Martin is currently working on a book for HarperCollins about the right-to-die movement in Canada and around the world. She was a Globe and Mail staff member for 16 years, known both for her reporting on the publishing industry and as a noted obituary writer. Her most recent book, Great Canadian Lives: A Cultural History of Modern Canada through the Art of the Obit (House of Anansi), has just appeared in paperback. – An acclaimed photographer, Kevin Van Paassen also spent a decade on The Globe and Mail staff, covering everything from Canada’s health-care system and the 2012 Summer Games in London to the war in Afghanistan, before launching his freelance career in Toronto. 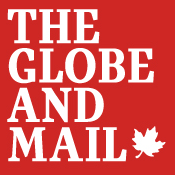 – Timothy Moore is a Toronto-based videographer and editor who’s been working with The Globe and Mail since 2012. He’s produced video on everything from the Olympics to politics and car shows, switching between video and animation to best illustrate the story. Cinematography and sound design projects keep him busy in off hours.